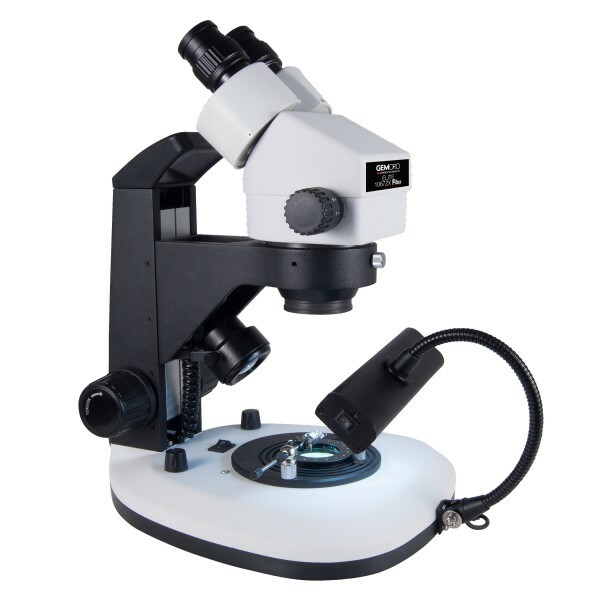 OUR ELITE SERIES GEMORO MICROSCOPE HAS EXCITING NEW FEATURES! NEW Full LED lighting – top and bottom (dark field) illumination. NEW LED Gooseneck overhead light source. NEW Magnetic rollerball stone holder / gem clip – PATENT PENDING. NEW Convenient handle for easy and safe transport. NEW Increased ergonomics with the low-positioned oversized focusing knobs. Forearms may now rest on the stage without fatigue after extended use. NEW Improved WF-15X eyepieces, providing crisp 10X-67X magnification. NEW Universal voltage power: 100V-240V with auto-switching. NEW Optional 2X auxiliary lens (doubler) available for magnification boosting (Item #1589).